Astrology is based on a certain amount of faith. Whether you believe in it or not, understanding astrology compatibility can only help you find a woman worth your time. At the least, consider it an entertaining way to approach your search for quality lesbian women to date. Many lesbian dating websites such as Zoosk understand the value of having astrology signs listed on your profile. The following tidbits are some basic astrology traits by sign to help you understand how the zodiac affects your dating life as you seek the perfect woman. Capricorns are stable and loyal people enjoy routines. When dating a Capricorn, don’t be surprised if they like consistently doing the same activities. These girls also have a bad habit of staying in stale relationships longer than they should. Aquarius like adventure and being creative. They tend to be very nonjudgmental towards others. 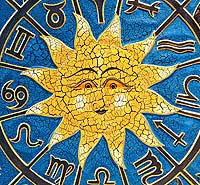 Aquarius usually think outside of the box which and can make life interesting by doing something out of left field. This sign tends to enjoy trying out new things in bed. Pisces are very sensitive and devoted to partners but also have a bad habit of feeling self-pity. These ladies may need help feeling better about themselves from time to time. They enjoy taking care of their partners in a nurturing way but don’t handle rejection well. Aries enjoy a challenge and getting the most from their relationships. Although they are a bit head strong at times, the desire to succeed gives these ladies a certain edge. They can have trouble admitting when they are wrong which sometimes leads to communication issues. Taurus are stubborn women who never give up even when things start to get difficult. These girls can sometimes let their stubbornness get the best of them during arguments. This sign enjoys routine and sometimes needs to be reminded to spice things up. Gemini enjoy being extremely social so don’t be surprised if you spend a lot of time in public with them. Sometimes they need to be reminded to tone things down a little when their partner is getting worn out by the social life. They are extremely passionate in their love lives so enjoy the ride. Cancer are the type of women that enjoy creating long term stable relationships with a heavy dose of romance. These ladies feel deeply and are the type to put their whole being into making things work out. They are very sensitive and prone to heart break from less gentle signs. Leo love attention and can’t stand to be ignored. Don’t be surprised when these ladies get annoyed with you for not giving them the attention that they deserve. They are not afraid to make themselves heard even if you don’t want to hear what they have to say. Virgos tend to approach relationships from an analytical point of view. These girls tend to look at relationships from the standpoint of how it fits into their lives and what they are getting from it. If they find themselves in a relationship that isn’t meeting their needs, they aren’t afraid to search elsewhere. Libra are naturally charming individuals who can be quite charming. Although these girls are friendly, they can be somewhat unsure of where they want things to go which can cause problems. When it comes to relationships however, they can be somewhat indecisive. Scorpio can be very difficult to handle because of their independent nature. They prefer to be in charge during relationships and don’t take well to being told what to do. This lends itself to arguments when their partner doesn’t agree with the approach being taken in the relationship. Sagittarius are straight forward people with good personalities. When they enter a relationship, they are very committed to making sure that everything works out well. These girls are willing to go the distance to make sure everyone is as happy as possible in the relationship. Using signs to find the perfect match can only help you find a woman worth your time. Even if you are skeptical, don’t be afraid to search by sign when using a lesbian dating site. You never know if it could help you meet someone interesting. Ready to ask the stars for the perfect match? Sign up to match.com and search for profiles using your astrological compatibility matches!